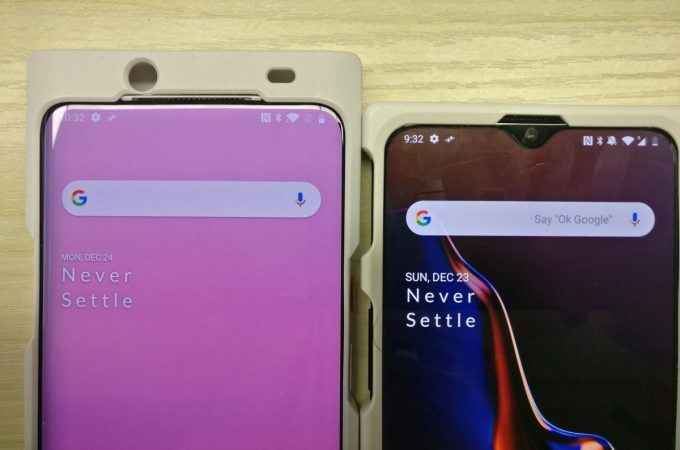 I’ll chalk this one up under “maybe”, but here we are with an important leak: OnePlus 7. The device has just popped up in a supposed photo, that shows it with a sort of pop up camera at the top, and an edge to edge screen. There’s no screen cutout for the earpiece or a front camera, while the screen goes all the way to the 4 edges. It’s shown in the picture right next to a OnePlus 6T for size. It seems to increase the diagonal a bit, or at least it’s placed higher than the predecessor. Since OnePlus is a sister company to Oppo, the firm may well borrow the Oppo Find X sliding mechanism. That comes with drawbacks, like the fact that the Find X is very fragile and breakable. I think it’ll adopt its own type of sliding or pop up front camera, that doesn’t copy anyone. That has been tried a lot lately by the Xiaomi Mi Mix 3, Honor Magic 2 and even the Vivo NEX with its tiny lift up selfie cam. OnePlus 7 is expected to bring 5G support, a Snapdragon 855 CPU and a new type of UFS 3.0 storage from Samsung, which popped up in benchmarks recently. I’m not very convinced by the format and I’m not sure it’ll happen this year. Also, in case it does happen and people aren’t happy with it, there’s always the OnePlus 7T to correct it.